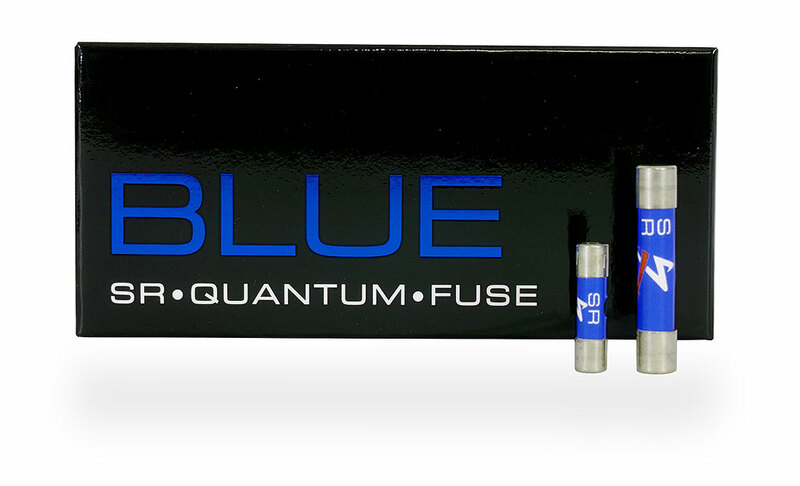 The Synergistic Research Blue Fuses is the newest state-of-the-art offering by Synergistic Research to further improve the performance of fuses in audiophile gear. The Blue Fuse series builds upon Synergistic Research's latest understanding of passive Quantum Inductive Coupling and sits at the pinnacle of the Synergistic Research Fuse lineupt. For the new BLUE fuse series, a newly developed UEF Graphene coating, that was two years int he making has been utilized. This, along with the UEF quantum treatments make the BLUE fuse substantially more holographic and dynamic than even Synergistic's own BLACK fuse. Resolution and musicality are unmatched. In addition to a proprietary conditioning process applied to the BLUE fuses, a million volt signal Synergistic Reearch refers to as 'Quantum Tunneling' alters conductive pathways within a specially developed burn wire. A Quantum Inductive Surface is also incorporated that includes Graphene. This stabilizes the electrical wave feeding your system, resulting in a meaningful improvement in system performance over standard, as well as audiophile grade fuses. How can fuses alter the sound of your system? For over 100 years, people believed electrons flowed like water through a pipe, and that once ‘contaminated’ by miles and miles of wire, there was little or nothing that could be done to ‘clean’ the electricity that feeds our systems. Today, physicists know that electrons don’t flow at all but rather propagate in an energy wave that moves along a conductor, with many factors that can alter this wave at a quantum level. To understand how electricity travels without electrons ever leaving their respective atoms it's helpful to envision the spectator ‘wave’ at a football game. Even though you can clearly see a wave pattern moving from spectator to spectator, as fans raise and then lower their hands (without hands jumping from one person to the next), so too does electricity ‘move’ without electrons ever leaving their respective atoms. Synergistic Research has isolated key factors that affect how electricity propagates by changing the behavior of electrons through Quantum Inductive Coupling. These methods Synergistic Research refers to as UEF Tech. UEF Tech is so powerful that even an electrical chain several miles long can be altered with nothing more than a fuse engineered with this UEF Tech. Because nearly all the electricity feeding our systems must first propagate through a fuse, significant gains in sound quality are possible when you introduce Synergistic Research BLUE Fuses to your system. We’re so sure you’ll love what Synergistic Research Blue Fuses can do for your system, we offer a 30-day money back guarantee (less shipping) so you can try in your system with no obligation if you’re not 100% satisfied with their performance. For best performance, fuses should be installed one way, listened to, and then reversed the other way to determine best sonic orientation. VH Audio recommends a brief reevaluation of directionailiuty AFTER the burn-in period of 300-400 hours, to your listening preference hasn't changed..
Synergistic Research BLUE Fuses require burn-in for best performance. While they should sound excellent within 20-40 hrs, in most cases, they will continue to get better out to about 300 hours. Please check your cart very carfully before checking out, to ensure you are ordering the correct fuse. We cannot accept returns on incorrectly ordered blown fuses, unless defective.